Working with work media is the same process as described here below, but done in Work media – Add images/videos. To add single video from Youtube or Vimeo use button Add Video from Youtube/Vimeo. To mark more items in Media Library and n item list, you can use Ctrl(Cmd) or key Shift while selecting them with the mouse. You can drag and drop each item to reorder them. 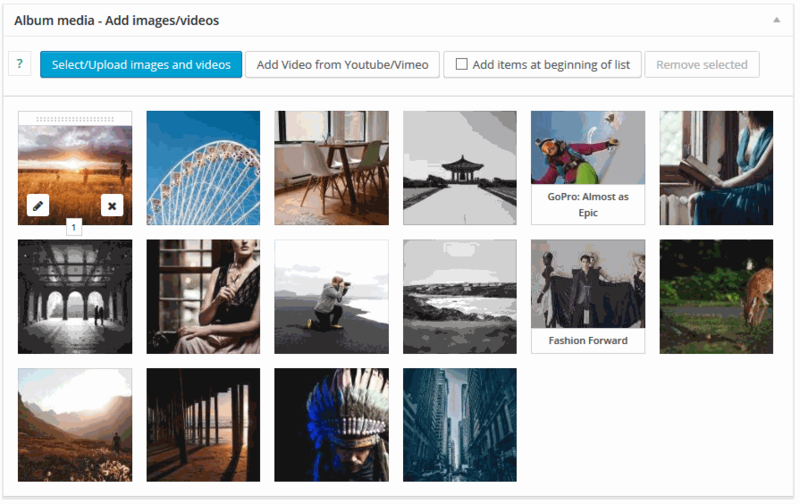 Every image and video from media library can be used only once in each album. To edit item details click on Pencil icon while hovering. Editing details of video from Youtube or Vimeo are done while editing item – Pencil icon. Bulk tagging is only available in Rife Pro. You edit each item by clicking Pencil icon on it. 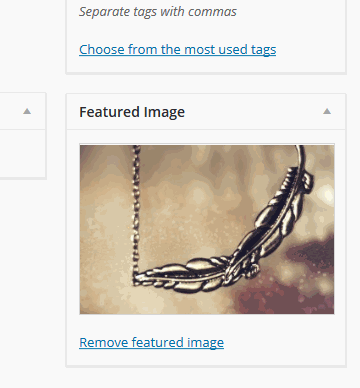 Tags – You can add tags here to enable filtering of items. Link – if filled then clicking image will take you to this URL. Also then this photo won’t be visible in lightbox. Product this image represents – If you fill this, then on image you will see “add to cart” button for selected product. You need WooCommerce and some products to use it. Color under photo – Used in slider. RatioX in bricks theme – How many bricks area should take this image. Used only in Bricks. Slider, scroller & bricks layout can use title and description that you provide for each item in Media Library. When you edit your album items Click Edit image details and it will open new window where you can change Title & description. Also when editing album please be sure to mark Show title and description of album items in Album options. RatioX in bricks theme – How many bricks area should take this video. Used only in Bricks. On new page that will open set featured image – it will be your thumb. Video Thumb – Displayed instead of video placeholder in some cases. If none, the placeholder will be used(for YouTube movies default thumbnail will show).